“Killing dots” or manually flagging data points that are likely not accurately modeling hydrographic data is only the beginning of a very lengthy process of refining hydrographic data for new high-quality nautical charts. Credit Hannah Marshburn for the photo. In the last post, I talked about how we collect the hydrographic data. The process of hydrographic data collection can be a challenge in of itself with all of the issues that can come up during the process. But, what happens to this data once it is brought back to the Fairweather? 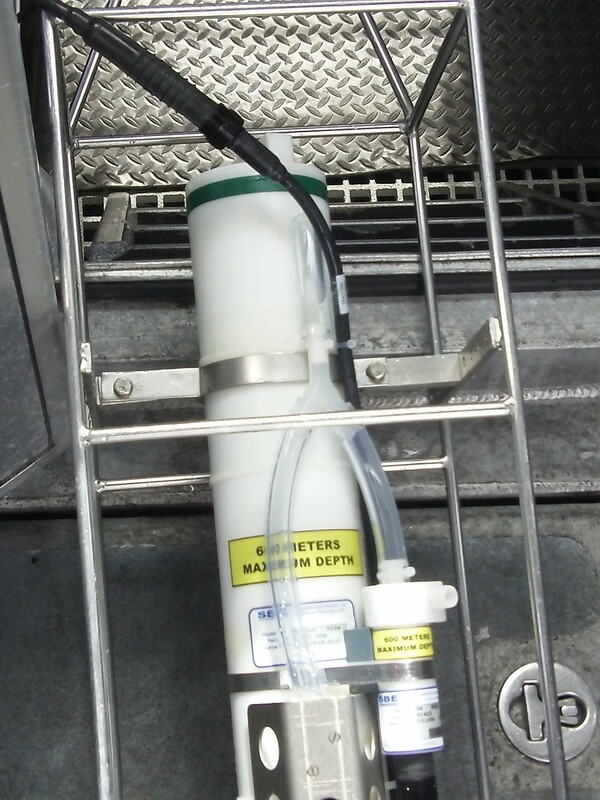 In many ways this is where the bulk of the work begins in hydrography. As each boat files back to the ship, the data they bring back is downloaded onto our servers here on the ship to begin processing. Just the process of downloading and transferring the information can be time consuming since some data files can be gigabytes worth of data. This is why the Fairweather has servers with terabytes worth of storage to have the capacity to store and process large data files. Once the data is downloaded, it is manually cleaned up. 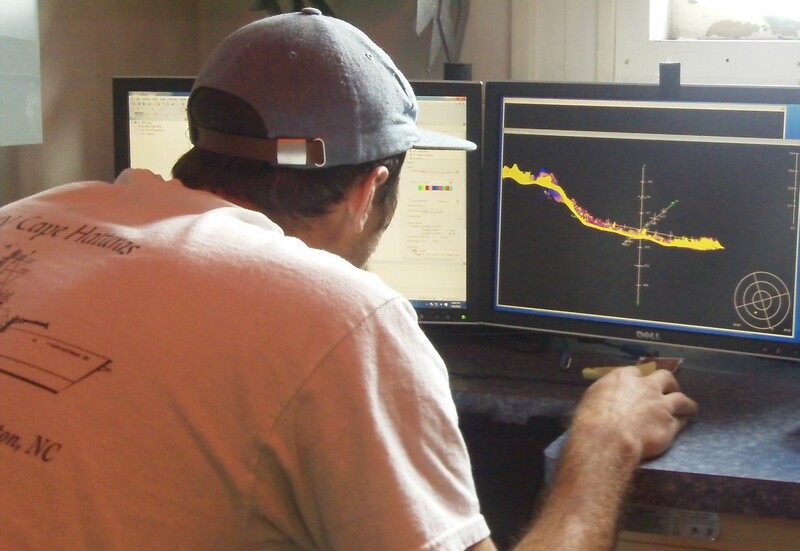 A survey technician looks at small slices of hydrographic data and tries to determine what is the actual surface of the bottom and what is noise from the multibeam echosounder. Leaving too many false data points in the slice of hydrographic data may cause the computer software to adjust the surface topography to reach up or below to something that in reality does not exist. The first phase of this is focused on just cleaning the data enough to prevent the hydrographic software from recognizing false topographies. Even though the data that does not likely represent accurate hydrographic points are flagged and temporarily eliminated from the topographic calculation, the flagged data points are retained throughout the process to allow for one to go back and see what was flagged versus what was retained. It is important to retain this flagged data through this process in case data that was thought to be noise from the echosounder really did represent a surface feature on the bottom. Hydrographic Assistant Survey Technician Sam Candio is using a three dimensional viewer to clean the hydrographic data collected from that day’s launches. Once this process is complete, the day’s section is added to a master file and map of the target survey area. This needs to happen on a nightly basis since survey launches may need to be dispatched to an area that was missed or one in which the data is not sufficient to produce quality hydrographic images. Each launch steadily fills in the patchwork of survey data; so, accounting for data, quality, and location are vitally important. Losing track of data or poor quality data may require another launch to cover the same area. After the survey area is filled in, refinement of the new map takes place. This is where the crude cleanup transitions into a fine-tuned and detailed analysis of the data to yield smooth and accurate contours for the area mapped. 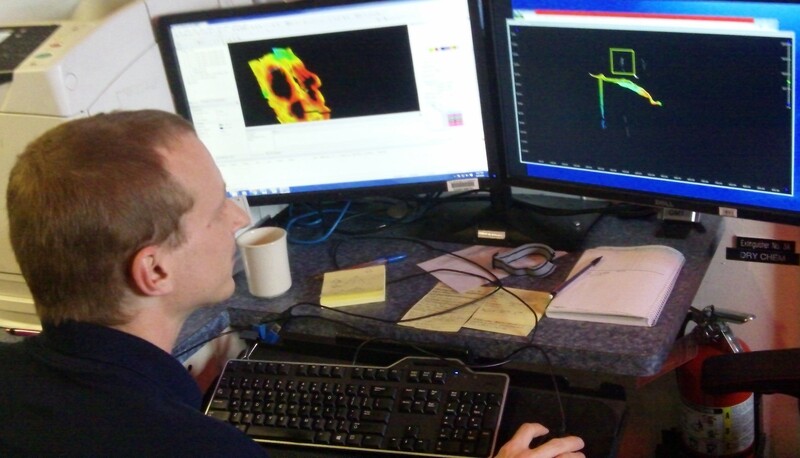 Data analysis and processing are the parts of hydrographic work that go unnoticed. Since this work involves many hours using cutting-edge technology and software, it can be easy to underappreciate the amount of work survey technicians go through to progress the data through all of these steps to get to a quality product. Dillion and family in Hoonah, Alaska. A friendly humpback is keeping our survey launch company as we map our assigned polygon. I know what you mean about the wildlife. I am seeing wildlife all over the place too. On our transit to our survey site from Juneau, I saw numerous marine mammals: hump back whales, dolphins, and killer whales. On our last survey launch, we had two humpbacks stay within site of the boat the entire morning. They are remarkable creatures. Whenever we locate a marine mammal, we fill out a marine mammal reporting form allowing various interests to use these reports to estimate the population size and range of these animals. The waters off the Alaskan coast are full of marine life for a reason. It is a major upwelling area where nutrients from the ocean bottom are being forced up into the photic zone where organisms such as phytoplankton can use both the nutrients and sunlight to grow. This provides a large amount of feed for organisms all the way up the food chain. This area is also known for its kelp forests. Yes, if you were on the sea bottom in these areas dominated by kelp, it would look like a forest! Kelp are a very long- and fast-growing brown algae that provide food and habitat for many other marine organisms. 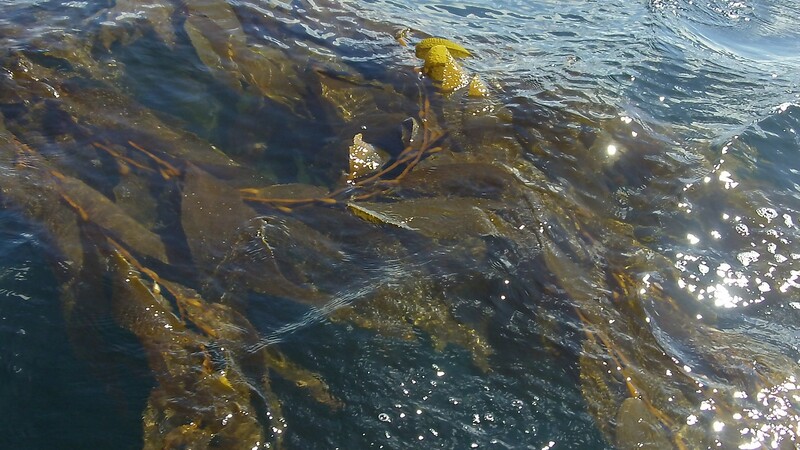 Kelp forests form on relatively shallow rocky points and ledges allowing for the holdfasts to form and latch onto the bottom giving the resulting algae growth the opportunity to toward the surface to collect large amounts of sunlight for photosynthesis. The RESON 7125sv multibeam echosounders found onboard the survey launches use a 200 kHz or 400 kHz sound frequency. This means the sound waves used fully cycle 200,000 or 400,000 times per second. Some humans can hear sounds with pitches as high as 19 kHz while some bat and dolphin species can hear between 100 and 150 kHz. No animal is known to have the capability to audibly hear any of the sound waves produced by the multibeam onboard our survey boats. Animals that use echolocation tend to have much higher hearing ranges since they are using the same premise behind acoustic mapping in hydrography but to detect food and habitat. The answer will be provided in the next post! This entry was posted in 2016, NOAA Teacher at Sea, Spencer Cody 2016 and tagged Alaska, CTD, Fairweather, Hydrographic survey, hydrography, NOAA Ship Fairweather, NOAA Teacher at Sea, noaa vessel fairweather, seafloor mapping. Bookmark the permalink.